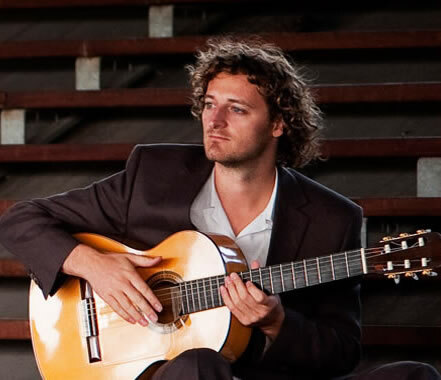 As an ward-winning Classical and Flamenco Guitarist, David has performed with some of Europe's top Artists including Leslie Garrett, The Gipsy Kings and The Royal Ballet. He has recorded at Abbey Road Studios and performed at The Royal Opera House, among many other prestigious venues. David studied classical guitar at the Royal Academy, London and then flamenco guitar at the Seville Conservatoire before releasing his highly-acclaimed debut album The View. This put him well on his way to becoming one of the most in-demand solo players in the United Kingdom. In 2008 David was chosen by the Gipsy Kings to play flamenco guitar on-stage and in the orchestra pit for their West-end production Zorro The Musical. After a highly successful season in London, the show went on to Paris, Moscow, Amsterdam, Tokyo and Salt Lake City. David's playing is ideal for weddings, whether creating an idyllic atmosphere as the guests are being seated for the ceremony, accompanying the Bride along the aisle for her processional or providing beautiful background music during the drinks and canapes or wedding breakfast. David plays a mixture of styles drawing from traditional classical Spanish repertoire, well-known pop songs arranged for solo guitar to traditional and modern flamenco. View a sample list of songs on his repertoire page. Here is a sample selection of David's repertoire.